I took Le Fanu out of Madras for a couple of reasons. The first was to place him in the wider British Empire, its Asian one, at least. That allows me to point to similarities and difference across the vast imperial holding. More specifically, it shows continuity in the British approach to control, but a variation in the local response. That is an important part of the tale about the rise and decline of the Empire, and causes Le Fanu to think even more about his personal and professional trajectories. The second reason was more personal. Along with my family, I loved living in Penang when I was working there in the 1990s, and return visits reminded me just how wonderful a setting it is for stories like this. That setting matches my fascination with so-called crime and place writing - where the location is as much a character as the protagonists. Spending a month there a year or so ago allowed me to roam about as a writer framing scenes, settings and possibilities, in a sense looking at it as someone like Le Fanu would have done in the 1920s. I hope Penangites recognise some of A Straits Settlement as authentic! Certainly, my friends will recognise the references to Straits Chinese porcelain. My growing collection started when we lived there. Le Fanu is drawn into the world of antiquities theft, and locals might even identify a certain antiques shop in the book. Importantly, though, the change in locale from Madras to Penang allowed me to test Le Fanu, as it were. By being there he sees possible different lifestyles and careers, an atmosphere different from the one he has difficulty with in Madras. Much of that is professional. In Penang he gets back to being a hands on detective, and that underlines just how much frustration he has had being a mere manager back in Madras. That is underlined by his colleagues in Penang - they are more like him than those back in Madras where he is becoming regarded as even more of a square peg in a round hole. And then there is Jenlin Koh, the Straits Chinese woman who brings yet more complexity to his personal life. 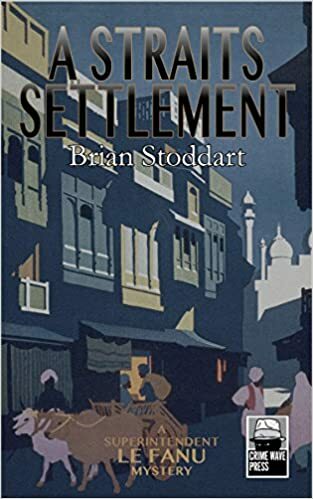 Like the earlier books, A Straits Settlement draws on events and people of the time to give it historical authenticity. For example, I have Le Fanu working in Penang with Rene Onraet who adds both a nice touch and a neat link. Onraet was born in India where his father was in the Indian Civil Service. Like the fictional Le Fanu, Onraet broke family tradition and joined the Settlements police. He learned Hokkien and Malay, busted gambling rings and criminal gangs, joined the intelligence service, became head of Special Branch and later Inspector-General of Police before retiring to Hampshire where life must have been very dull. This larger-than-but-real life character is the perfect sounding board for Le Fanu. By the end of the book, then, Le Fanu is still in his new imperial setting and, as usual, facing personal and professional choices. What will he do next? Le Fanu Four is on the way.